In late 1993, just a few months before the opening ceremonies of the 1994 Lillehammer Winter Olympics, a young speed skater by the name of Johann Olav Koss led a humanitarian trip to the small African country of Eritrea. 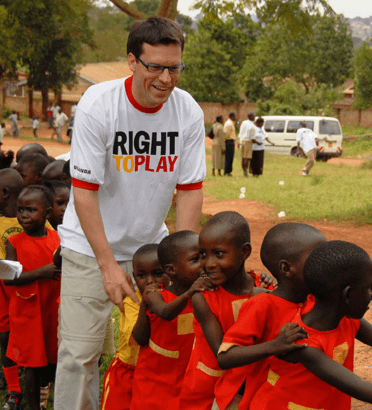 Working as an ambassador of the organization Olympic Aid (later to become Right To Play), the Norwegian athlete found himself face-to-face with the realities of life in a country emerging from decades of war. As children played amidst burned-out tanks, under the watchful eyes of war martyrs exalted in surrounding posters and murals, it was one boy who crystallized the epiphany for Johann that would inspire the future of Right To Play. The boy then took off his shirt, rolled it up, and, using the sleeves to tie a knot, he turned the shirt into a ball that they used to play in the streets. The game ended when it was time for the boy with the long sleeves to go home. Traumatized, these children had lost family and friends to the violence, and yet, surrounded by a legacy of war, they only wanted one thing: the opportunity to play. Johann promised the boys he would return after the Olympics with a proper ball for them to play with, and in that experience the idea that would become Right To Play was born.